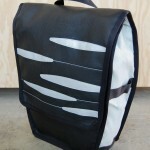 They’ve done it again–come up with a new bag just in time for Filmed by Bike! This time your pannier will be reflective! Be the first one on your block to have one.